The Waco 9 is an American-built biplane design that first flew in 1925. The Waco 9 was the first of the steel-tubed fuselage aircraft designs to be built by the Advance Aircraft Company, which became the Waco Aircraft Company circa 1929. 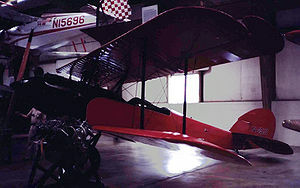 The Model 9 was a three-seat open cockpit biplane with the ailerons on the upper wings extending outboard of the main wing surfaces. About 270 Model 9 aircraft were built during 1925 and 1926. The Model 9 was of rugged construction to meet the barnstorming requirements of the period. The cost when new was between $2,025 and $2,500. A Waco 9 was flown in the 1926 Ford National Reliability Air Tour. The Model 9 was the first aircraft type to be fitted with aluminum floats (by the EDO Corporation in 1928). By 2007, a few examples remained airworthy in the USA and five aircraft were held by museums. Model 9s were fitted with a variety of engines including the 90 hp (67 kW) Curtiss OX-5, the 100 hp (75 kW) Curtiss OXX-6, 100 hp (75 kW) Curtiss C-6 and the 150 hp (112 kW) Hisso A. Fitment of the various engines did not change the model number.